Today would be a great day to bring everyone up to speed on what's been happening on the Hindenburg Omen front lately. 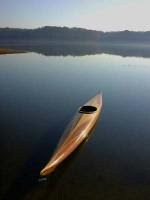 Obviously you can see that this blog had gone very quiet on that topic and the main reason for that is that as of May 3rd the Hindenburg Omen has been out of commission due to a rule violation. It's a rule which for 27 years has been absolutely cast in stone... an absolute MUST in accordance with the rules set out by the inventor of the HO, Mr. Jim Meikka. I realize that there have been several stories lately stating that the HO "has gone off". But unless there has been a rule change regarding the requirement that the 50 day MA on the NYSE "must be rising", there is simply no way that any recent report of an HO signal can be accurate. To the best of my knowledge, the last time the HO issued a signal was in August of 2010. I say this with all due respect to those who have reported an HO signal recently because it is possible that Mr. Meikka changed a rule that has been in place since day one of the HO's very existence, but I didn't get the memo. That's possible... and if that's the case then I am behind the curve. 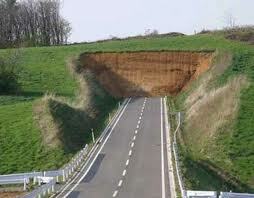 Until today I had made every effort to ensure that I was "ahead of the curve" regarding the HO rules. Otherwise I'd just be your everyday friendly reporter with inaccurate data. And if that was the case I wouldn't even bother writing 10 keystrokes about it. NYSE Daily - A chart specifically designed to monitor the moving average. Click here for a live and updating version. I do know with certainty though, that there are some sites who are still using the rules of 10 years ago, totally unaware of two very important changes that Mr. Meikka made a couple of years back to adjust for the relatively higher number of ETFs and bond funds. Those changes absolutely 'did' prevent a couple of signals that I know of. In any case, in order to attempt to clarify the possibility that I have missed an important adjustment by Mr. Meikka, I have sent an email off to Mr. Arthur Hill after reading his report at StockCharts, in an attempt to find out if he can enlighten me about that change. [I was only informed of Mr. Hill's article yesterday.] I'd get in contact with Mr. Meikka himself if I could but to date I haven't discovered how to contact him. I seriously doubt he has changed this rule though since it's so germane to the entire workings of the HO. But I'm just as fallible as the next guy... I might be wrong. Mr. Hill is a very credible analyst so to be honest I'm not willing to just disregard his findings. But until I get some sort of verification that Mr. Meikka has changed this rule... I have to surmise that there has been no HO signal since August of 2010. As I said though, I stand to be corrected if necessary. In any event, as of the close yesterday, that's all a moot point now since the 50 day moving average on the NYA (NYSE) has turned higher. So as of this morning the Hindenburg Omen is back online and able issue an alert. And judging by the price action of 10 weeks ago, it isn't likely the HO will be switched off in the immediate future. It makes perfectly good sense too, that the HO "should be" switching on and off as it gets near to issuing a signal. After all, what the HO issues warning about is an imminent decline. One would think that would happen near a market top, right? And what else happens at a market top? The 50 day moving average rolls over! So obviously there's a fairly narrow window within which the HO can raise the flag. In that regard, the HO is very much like a television that's on its final legs. It first begins to flicker, then it issues an important alert, then it breaks down altogether. Once the HO has issued its signal accurately and the market rolls lower, and it the 50 day MA rolls over with it as it should, the HO is immediately rendered "dead". But it has done its job. But regarding those who don't really care about the official rules, as I described to my good friend Pebblewriter in a recent comment: "It's similar to watching a TV that isn't plugged in. If it's not plugged in we're not gonna get a signal. But somehow some of the analysts out there are able to sit back and watch the HO that's not plugged in and by some form of magic get some kind of entertaining "Urgent News Alert" out of it. That's quite the talent isn't it?" When I made that statement, I was envisioning one site in particular which is no longer even in existence where the author was just chomping at the bit to "be the first" to make the announcement. It always amuses me to see who's going to be first and then who else takes the bait and jumps on that bandwagon. Even ZH has reported HO signals when the TV wasn't even plugged in. So my entire purpose in running a blog at Seeking Alpha that has been dedicated solely to the HO topic for nearly three years now was to provide "accurate" signals for my friends over there. And of course... I also brought the topic over here when I started this blog a half year ago. UPDATE: Only moments after having published this article, the mystery has been solved. I just got of the phone with Tom McClellan and he informs me that there has been no rule change and that my understanding of the rules is correct. Unfortunately (or fortunately), Mr. McClellan confirms that my suspicion that Mr. Hill 'misinterpreted' the rules is indeed correct. In no way do I mean to disparage Mr. Hill either. He's a stud of an analyst for whom I have a great deal of respect. It's just one of those innocent things. So stay tuned... yesterday the number of new 52 week highs and 52 week lows were right in the ballpark for an HO signal. And now that it's "back online" any signal in the coming days "will be" accurate. Let's just sit back and see what happens now. Meanwhile, how about a little Joe Cocker? Live in Berlin. 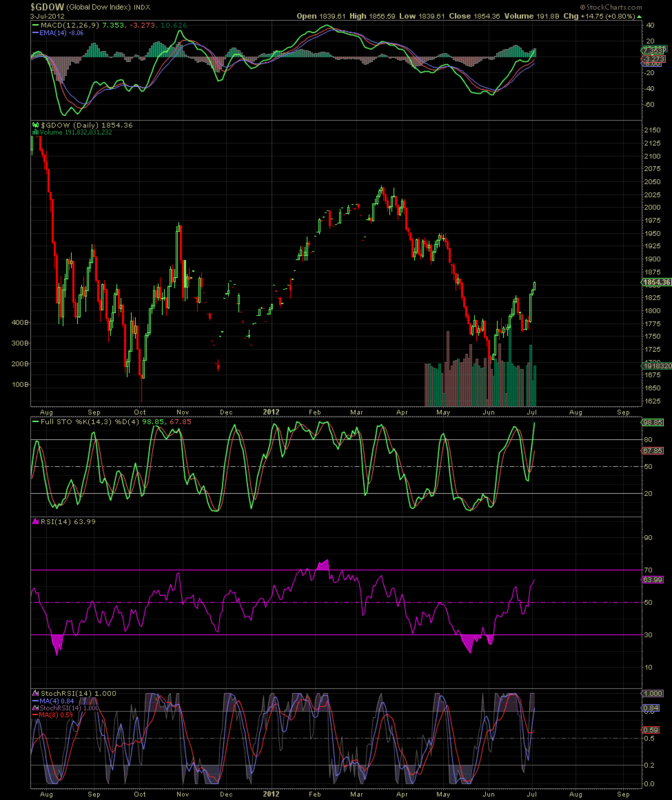 What I've been watching is the negative divergence seen at the top of the recent action (red and yellow arrows). 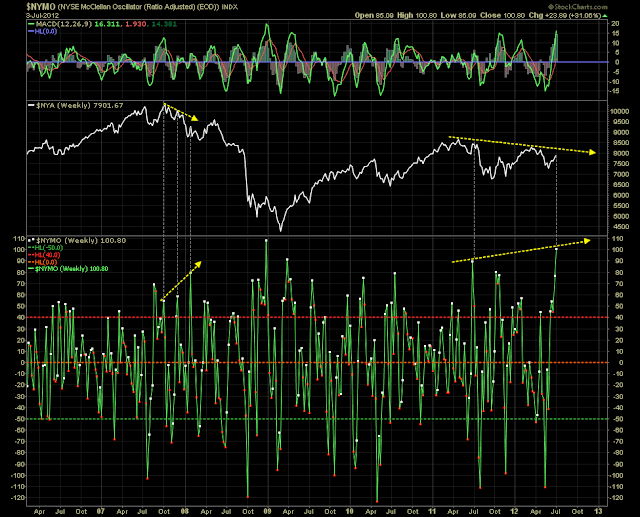 First of all, the histogram was indicating that a reversal in NYSI was imminent. What wasn't clear was whether or not the market would roll lower with it. If the market does not roll lower with NYSI, as seen in Feb. of this year, then a different form of neg. divergence is setting up between NYSI and the market itself (NYSE). In a case such as that, we know the bulls are still in charge and we'd have to wait for some form of a second rollover in NYSI that coincides with the market finally turning south. We saw that in March of this year and all that really happened at that time was that NYSI simply consolidated until the NYSE caught up with it and finally decided to tank. At that time they both keeled over and puked at the same time. Kind like me and my old drinking buddies used to do. 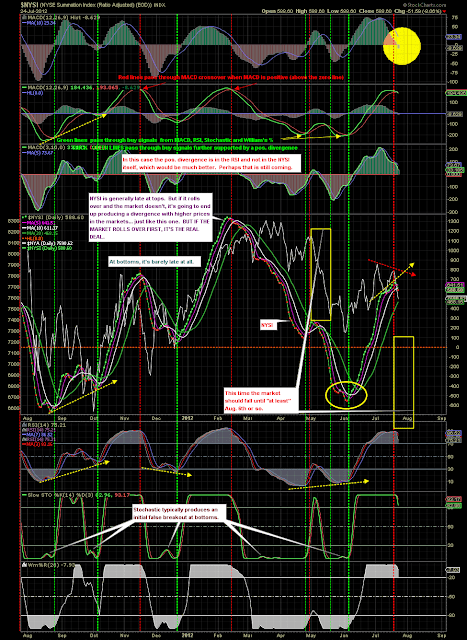 However, as I noted on this chart back on June 12th, if the market rolls over FIRST or COINCIDENT WITH a NYSI that has turned lower... watch out because it's the real deal. 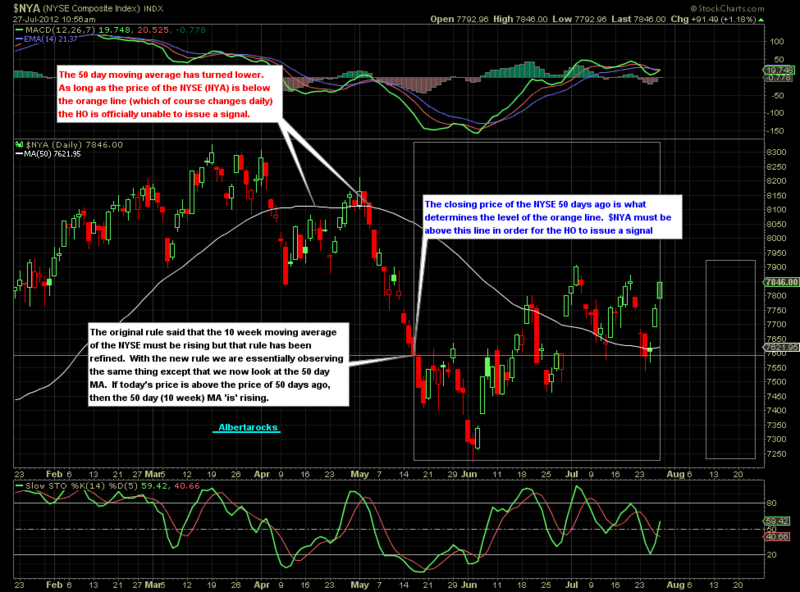 The chart is actually from this article which I had published regarding the coming bounce. And man... did the market ever bounce. Five ugly times to be exact. But as demonstrated in the original publication of the chart... we have a REAL DEAL goin' on here now. And all indications are that we probably can't even expect much of a bounce until August 6th or 10th, thereabouts. Not a big bounce at least. Some readers might recall my explanation about 'why' momentum indicators do not produce a divergence at the top of a wave 2 or a wave C. Although not exactly the same, this is very similar to one of those cases. In that previous explanation I was referring to an RSI or stochastics indicator. But the 'cause' is the same in this case... tthere will be no more upward waves to cause a neg. divergence between NYSI and the NYSE. Please don't misunderstand... that doesn't mean there won't be a bounce. It just means that if there is a bounce, it will be a dud in that the market will not reach new highs. But to reiterate, even so... we shouldn't see any bounce of any significance until somewhere around Aug. 8th give or take a day or three. When I look at the futures tonight, and at all the pos. 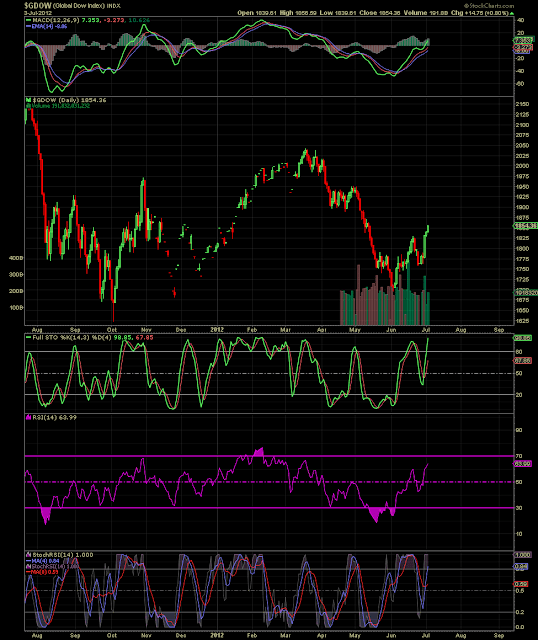 divergences on every time frame, I'm certain a bounce is coming. But according to the much more significant and reliable signals coming out of the market internals data, it's not likely going to be much of a bounce... just another great shorting opportunity. But I've learned my lessons by now... the Orcs of New York are so powerful that God only knows what they can do. My confidence has been shaken to its very core by those bastards but I'm going with what I'm seeing... this market is gonna tank big time. I hope everyone out there is doing real well and that you're able to capitalize on the markets in the weeks ahead. Personally I don't think there's much chance it's going to be anywhere near as choppy as it has been since early June. Think... "more linear". Until next time... whenever that is... stay well! Well it's the eve of another glorious birthday for the USA and we'd like to take this opportunity to wish our American brethren our most sincere best wishes for another happy and prosperous year. In fact we hope it's even better than the last one. God knows, it had better be. So over the past two weeks, perhaps in celebration of another upcoming glorious chapter in the story of the United States of America, the markets have partied like there's no tomorrow (perhaps not the best choice of words) and have run up so far, so fast that suddenly we find ourselves looking at a divergence situation in the McClellan Oscillator not seen since this very weekend of last year. Also of note is the very intriguing fact that this same time period (between the last day of June and July 4th) has marked a very important turning point in the markets for the past 3 years running (more on that below). This short one week period produced a low in 2009, another low in 2010 and a peak in 2011. If this same week in 2012 is going to also mark a crucial turning point in the markets, it's pretty difficult to imagine it as being a low. Of prime interest here is the fact that at the end of June, NYMO registered the highest monthly reading of all time. Interestingly, the last time it was up in the nosebleed section like this was in May of 2004, a full year after the market low of March 2003. It just stands to reason that after stocks have gone through a crash such as that which occurred between Aug. 2000 and 2003, perhaps as many as 90% of all stocks had been declining. So it's natural that once a recovery takes hold, a whole lot of those 90% of stocks that had been declining suddenly begin to rise in unison. And of course that quickly shoots the McClellan Oscillator through the roof. The exact same effect occurs with the much esteemed Zwieg breadth thrust indicator, but from past experience I can assure you, 95% of investors I've run into simply cannot understand how a breadth thrust can happen on a mere recovery off a severe low (which can turn out 'not' to be 'the' low). They laugh at me. I smile politely as I quietly relieve them of their wallet. But I digress. So we now have to ask the questions: "Are we seeing the markets just at the verge of cracking up and heading toward 1100? Or are we seeing the markets on the verge of a new bull run such as that magnificent rally that began in March 2003 and lasted four and a half years?" 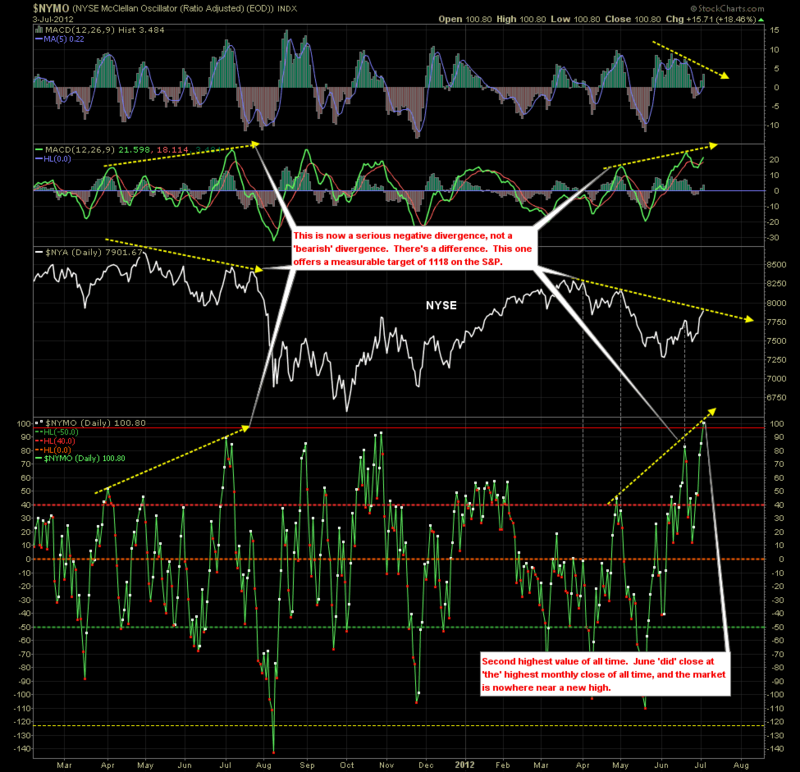 To tell you the truth, as far as the McClellan Oscillator is concerned, it really could be either. At the end of June, the McClellan Oscillator closed the month at the highest reading of all time (on a monthly basis). On a weekly basis, and even as of this evening, NYMO is currently sitting at the second highest reading of all time. Looking at both charts above, in consideration of where the McClellan Oscillator currently resides, the only thing we know with 100% certainty is that the market is going to be headed south at any moment. Perhaps it will begin with the market open on Thursday. Perhaps the rally can even last as long as to finish out the week a bit higher. But it's going to pull back. If you're long... get out because the potential for downside risk dwarfs any reward you could possibly gain over the coming weeks. You got your 8% in six days... now take it off the table. This is a conclusion that's not even open for debate. C'mon investors, the markets have just put in a magnificent 8% rally in 6 days, closing on the one week window that has marked a major turning point in 1998, 1999, 2003, 2006, 2007, 2009, 2010 and 2011. True enough, not all of them were tops. But if a turn is going to happen during this same week of this year, I can tell you this year it ain't going to be a low. The question that is still open for debate is how far that pullback is going to go. That part I don't pretend to know. All I'm very comfortable with is that the market internals are sending a signal that basically says "enough already" and that we'd best be prepared for the inevitable... and that being "no bulls, you're not going to get another 8% over the next 6 days." And finally, the divergence that has developed is not a bearish divergence but a negative divergence. They are not the same thing. The bearish divergence, one in which the index makes a new high but it's indicators do not, does not offer measurable targets. The one we're looking at today is a negative divergence, one which 'does' offer a measured move possibility. In these cases, the indicators make a new high but the index does not. With the negative divergence set-up that we're faced with currently, we're looking at a measured move to 6234 on the NYSE (NYA) and 1118 on the S&P 500. I wish I could offer a money back guarantee that these targets are going to be hit. But considering that we're now living in a matrix where the central banks of the world just keep pulling one green rabbit after the other out of their greasy asses, who in heck knows for sure whether or not these divergences and the message they deliver will be obeyed this time around? If there were no such thing as central bankers I'd offer that money back guarantee. Mind you, if there were no such thing as central bankers the Dow never would have gotten over 1000 in the first place. So stay tuned... the potential for a big decline does indeed exist despite the stink of euphoria permeating the planet's otherwise breathable atmosphere. Wishing all of you nothing but success going forward... and a beautiful and happy summer.